Hello! Today I have a quick swatch of Bear Pawlish 'Scar' to show you. It was part of the November 2015 Paint The Rainbow box, which I didn't manage to get at the time. The remaining PTR boxes (up until May's) have now been split up, with all proceeds going to charity. 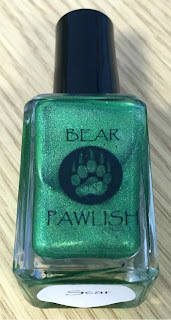 As soon as I could I made an order and grabbed 'Scar' - my first Bear Pawlish! Read on for my swatch and more info. 'Scar' is a vibrant bright green holographic with metallic green flakes. The brush in this is quite short, but it didn't make a difference to application. It was still very smooth and easy to apply. It was a bit sheer and patchy on the first coat, but a second covered perfectly. I also found that the flakes laid nice and flat. Below is two coats and topcoat. What do you think? I could not be happier that I finally have this! I had been so close to putting out an ISO for it in several destash groups, something about it just screams to me. I love the bright vivid colour, and the flakes really add something extra - they almost look black at certain angles. I already want to put it back on! The last few bottles of 'Scar' are available for £9 on Rainbow Connection here. 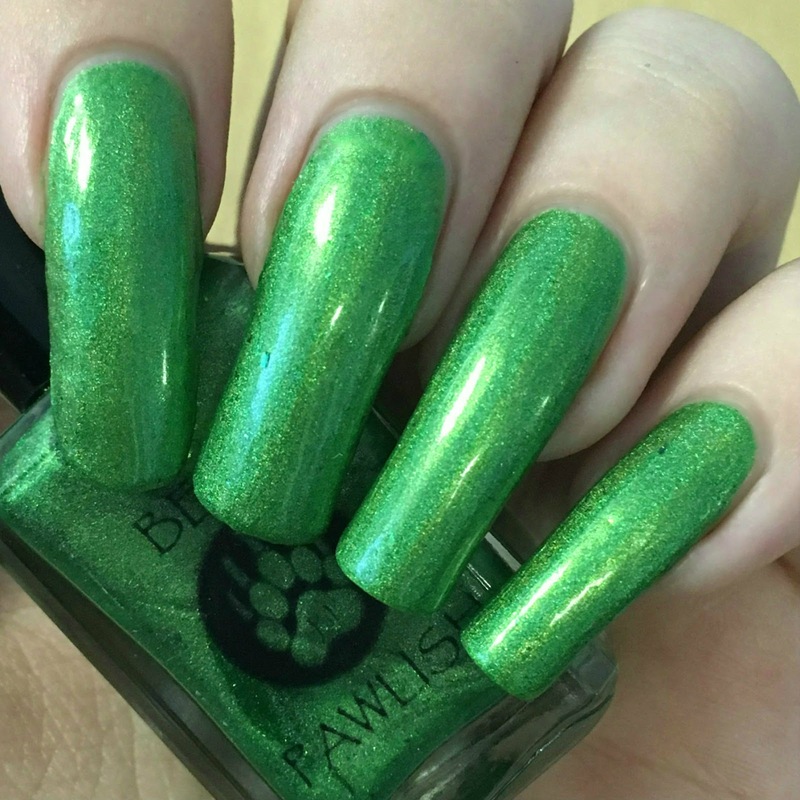 I love green polish so this is right up my alley. I haven't tried this brand yet but it's on my list!